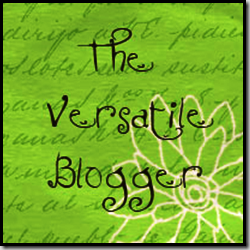 I just received a Versatile Blogger Award! 1. Thanks the person who gave you the award and link back to them. Thanks, Stevie at Moore Babies! Stevie has some cute crafts and yummy recipes, not to mention 2 adorable little girls! You should check her out. 2. Tell 7 things about yourself. 1. I love warm weather and hate the cold. I am a baby about being cold for sure.... probably has to do with growing up in FL. 2. I bring my lunch to work every day. Seriously, every day. I am thrifty like that and want to eat healthy. 3. I am trying my hand at all sorts of different crafts and redos therefore my list of "want to do's" has gotten rather long. 4. In reading that Stevie is slightly afraid of the ocean, I was stung by a stingray while with my family on a beach trip in high school. It was not fun and now I HIGHLY recommend the stingray shuffle. 5. When I was younger I was a total danceaholic... ballet, tap, jazz, pointe, you name it.. competitive dance team in high school too. I did the sorority dance team in college which was a blast! And I still love dancing now at weddings, randomly around the house and such. 6. I went to the State Science Fair in high school with a project about biodegradability... totally ahead of the being green thing. 3. Pay it forward and award the Versatile Blogger to 15 recently discovered new bloggers. Or perhaps new(ish) to me cuz well 15 is a lot! I tried to find blogs I like to read that did not already have the award too so hopefully most do not. Click over to these awesome blogs! Thanks so much for giving this award to us! Love your blog! I LOVE your post and Love your blog! I would LOVE to have you link up to my Whassup Wednesday Par-Tay! And I have a party button you can grab and put on your blog so your friends can come too:) You have a good chance at being featured! If you are NOT already a Follower of Elements Interiors....HELLEEERRRR! a Winner EVERY MONDAY!!! With GREAT Goodies you wont want to miss!! Hope to see ya at Whassup Wednesday!!! Thank you so much for the award and congrats to you too!